For Americans, the rest of the world, and most Japanese, World War II ended when Japanese Emperor Hirohito announced Japan’s surrender in a radio address to his people on 15 August 1945. The formal surrender ceremony took place 18 days later, on September 2, in Tokyo Bay on the deck of the U.S. battleship Missouri. There were some isolated Japanese soldiers, however, cut off from communications and scattered on various Pacific islands, who did not know the war was over. Their surrender was to come years – even decades – later. For Shoichi Yokoi, the end came when he was finally captured by two local fishermen on the island of Guam on 24 January 1972 – almost 28 years after U.S. forces had liberated the island from Japanese control in 1944! During nearly three decades in hiding, Yokoi had barely subsisted on shrimp, fruit and nuts, searching for food at night and hiding in a cave during the day. He was one of the last three WWII Japanese soldiers to surrender. 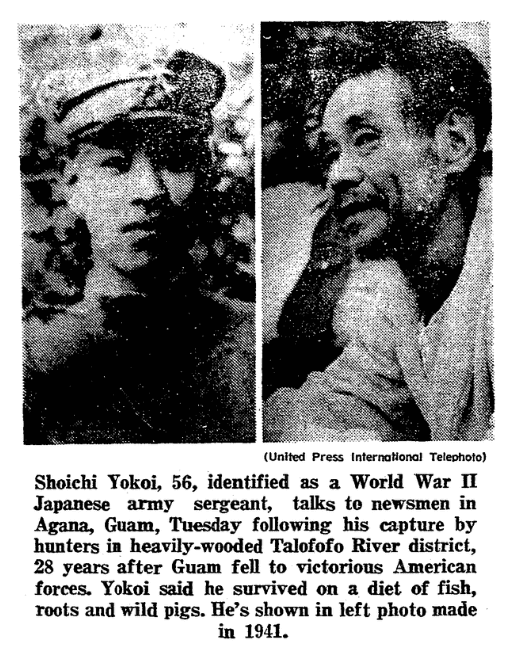 Originally Yokoi was one of 10 soldiers who fled into the Guam jungle following the American attack; most of the men moved on but Yokoi and two others stayed in the same general area. The three men interacted from time to time, until Yokoi discovered the other two dead in a cave in 1964. For the last eight years of his ordeal Yokoi was completely alone. Yokoi knew the war was over after reading leaflets the victorious Americans had dropped into the jungle, but he dared not surrender. For one thing, he feared execution. For another, he was a faithful, obedient soldier – the last order his commander gave him was to never surrender, and Yokoi obeyed that order for 28 years. 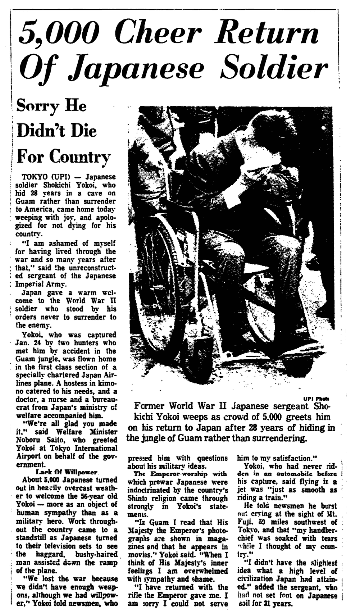 The following four newspaper articles tell his incredible story, from his capture on Guam in 1972 to his emotional return to Japan after an absence of 31 years. 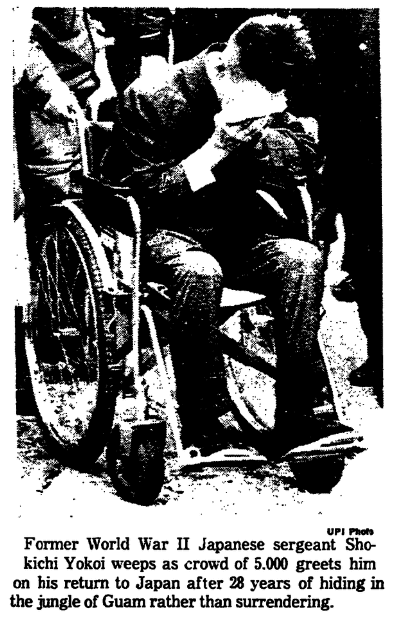 He lived for another 25 years after his Japanese homecoming, dying on 22 September 1997, at the age of 82. AGANA, Guam (AP) – Two fishermen have captured a man who told authorities he was a Japanese Army sergeant and had fled to the jungles and hid when Americans invaded the island almost 28 years ago. Officials said the man, Shoichi Yokoi, 58 , was dressed in ragged burlap but apparently was in good health. He was taken under protective custody Monday to Guam Memorial Hospital at Agana. The fishermen said they subdued Yokoi as he tended a fish trap in the Talofofo River, about four miles from the tiny village of Talofofo, 10 miles across the island from Agana, the principal city. Officials said Yokoi told them he arrived on Guam with the Japanese Army from Manchuria in 1943 and that he and nine other soldiers fled to the jungle during the American invasion of 1944. Officials said Yokoi told them he had lived alone for the past eight years. It was not clear what happened to the others. Two Japanese soldiers were captured in the jungle in 1960. An island-wide unsuccessful search for others was conducted in 1964 after fresh footprints were found in the dense jungle. Officials said Yokoi told them he learned about 20 years ago that the war was over but he was afraid to come out of hiding. He said he lived on shrimp, fish and nuts. Fishermen Jesus M. Duenas, 48, and Manuel D. Garcia, 36, said they saw Yokoi when they went to check their traps. Duenas said he first thought Yokoi was a village boy who is considered “strange” and runs away from adults. He said he approached Yokoi and the man dropped his fishing and charged him. Duenas said he and Garcia subdued Yokoi, took him to the village and summoned authorities. In Agana, James Shintaku, the honorary Japanese consul, interviewed Yokoi. Shintaku said he offered Yokoi food but Yokoi turned it down, saying his stomach would not tolerate it. The consul said Yokoi told him he was from Nagoya, Aichi Prefecture. Shintaku said Yokoi told him he kept his hair and beard trimmed with scissors. Yokoi said he became violently ill three times during the years he was hiding, once after capturing and eating a wild pig, Shintaku said. The consul said Yokoi told him he has mixed emotions about returning home. AGANA, Guam (UPI) – The Japanese Imperial Army troops who occupied Guam in World War II were under orders to never surrender to the Americans who stormed the Pacific island on July 21, 1944. Sgt. Shoichi Yokoi was faithful to that command for nearly 30 years. It was a chance meeting in the fading light of dusk with two hunters that managed what the U.S. 3rd Marine Division and the Army’s 77th Infantry had not accomplished – the capture of Yokoi. The hunters surprised Yokoi, 56, as he was tending a homemade shrimp trap in the Talofofo River, 20 miles outside Agana Monday night. Yokoi told how he had survived for 28 years in the jungles of Guam on a diet of nuts, breadfruit, mangos, papaya, shrimp, snails, rats and frogs. He drew the line at snakes. A tailor when he was drafted into the Japanese Army in 1941, Yokoi said he weaved a burlap-like cloth from tree bark fiber and fashioned himself trousers and a jacket. He said he used a pair of scissors he carried through the war to tailor the clothes and to cut his hair. He was heavily bearded. He said he heard of neither the atomic bomb nor television and stared in incredulity when told that a jet plane would return him to his hometown of Nagoya in three hours. In Tokyo, the Japanese government said it would pay Yokoi’s fare to Japan and James Shintaku, honorary Japanese consulate on the island, said he would make travel arrangements. A spokesman for the Japanese Ministry of Welfare said there was no doubt the man on Guam was the same soldier reported dead on Sept. 4, 1944. Yokoi said other Japanese troops scattered into the wilderness of Guam when the Americans recaptured the island but that he found his last two companions dead in a cave eight years ago. “I believe they died of starvation,” he said. His family in Japan was notified in September of 1944 that he had been killed in action. Both his parents are dead. His only surviving relative is Osamu Yokoi, 42, a cousin. 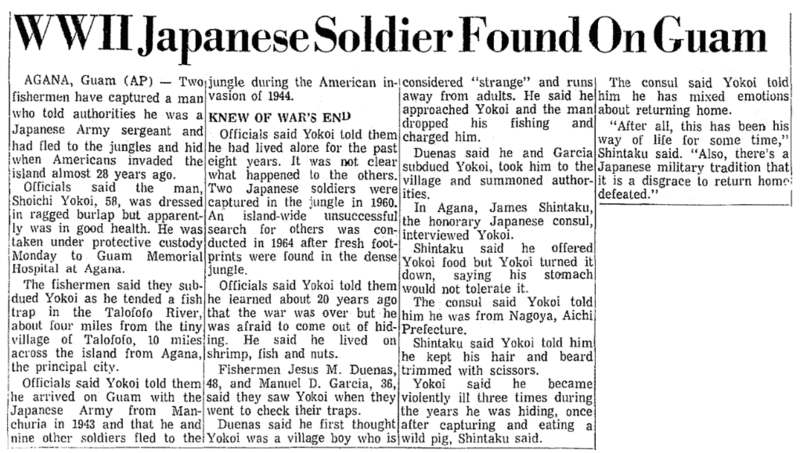 Yokoi said he knew the war was over at least on Guam because of leaflets he found scattered through the jungle. But he held out, fearing he would be executed if he surrendered. Doctors at Guam Memorial Hospital said Yokoi’s blood pressure and heart pulse are normal but he is anemic. His hands are heavily calloused. TOKYO – News of Sgt. Shoichi Yokoi’s belated farewell to arms, after evading capture for 27½ years in the jungles of Guam, brought an immediate and sensational reaction in Japan. Radio and television stations and Tuesday afternoon newspapers gave saturation coverage to Yokoi’s discovery by two Guamanian fishermen late Monday, apparently the island’s sole surviving Japanese soldier. It is likely his reception here, probably next week, will resemble a hero’s welcome, although Yokoi, 58 , will be coming back to a Japan in which 52 per cent of its population was born since he last saw it in 1941. It will also be a country in which he has no family. Drafted unmarried at age 26, Yokoi had no brothers or sisters and both his parents died after the war, his father 23 years ago and his mother 17 years ago. 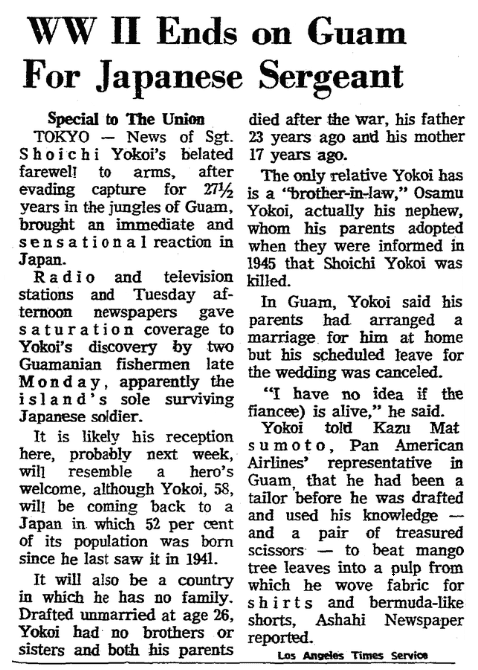 The only relative Yokoi has is a “brother-in-law,” Osamu Yokoi, actually his nephew, whom his parents adopted when they were informed in 1945 that Shoichi Yokoi was killed. In Guam, Yokoi said his parents had arranged a marriage for him at home but his scheduled leave for the wedding was cancelled. “I have no idea if the (fiancée) is alive,” he said. Yokoi told Kazu Matsumoto, Pan American Airlines’ representative in Guam, that he had been a tailor before he was drafted and used his knowledge – and a pair of treasured scissors – to beat mango tree leaves into a pulp from which he wove fabric for shirts and Bermuda-like shorts, Asahi newspaper reported. TOKYO (UPI) – Japanese soldier Shoichi Yokoi, who hid 28 years in a cave on Guam rather than surrender to America, came home today weeping with joy, and apologized for not dying for his country. “I am ashamed of myself for having lived through the war and so many years after that,” said the unreconstructed sergeant of the Japanese Imperial Army. Japan gave a warm welcome to the World War II soldier who stood by his orders never to surrender to the enemy. Yokoi, who was captured Jan. 24 by two hunters who met him by accident in the Guam jungle, was flown home in the first class section of a specially chartered Japan Airlines plane. A hostess in kimono catered to his needs, and a doctor, a nurse and a bureaucrat from Japan’s Ministry of Welfare accompanied him. “We’re all glad you made it,” said Welfare Minister Noboru Saito, who greeted Yokoi at Tokyo International Airport on behalf of the government. About 5,000 Japanese turned out in heavily overcast weather to welcome the 56-year-old Yokoi – more as an object of human sympathy than as a military hero. Work throughout the country came to a standstill as Japanese turned to their television sets to see the haggard, bushy-haired man assisted down the ramp of the plane. 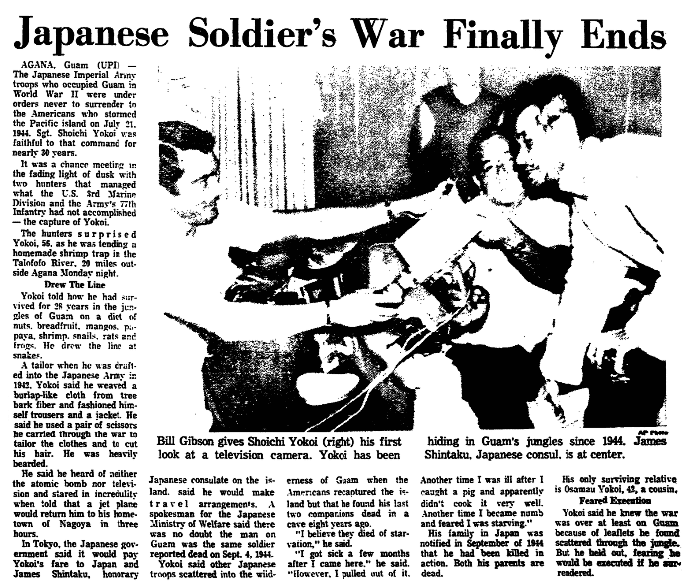 “We lost the war because we didn’t have enough weapons, although we had willpower,” Yokoi told newsmen, who pressed him with questions about his military ideas. The Emperor-worship with which prewar Japanese were indoctrinated by the country’s Shinto religion came through strongly in Yokoi’s statements. “In Guam I read that His Majesty the Emperor’s photographs are shown in magazines and that he appears in movies,” Yokoi said. “When I think of His Majesty’s inner feelings I am overwhelmed with sympathy and shame. “I didn’t have the slightest idea what a high level of civilization Japan has attained,” added the sergeant, who had not set foot on Japanese soil for 31 years.